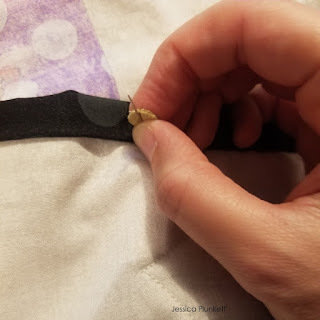 Several months ago, I put a call out on Instagram asking other quilters to share finger cover recommendations for hand sewing. I started on a pretty massive English paper piecing project and my poor finger was tired of trying to push the needle through fabric. I had also asked for hand sewing needle recommendations, which garnered much more conversation and ideas. 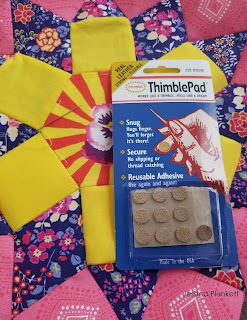 But one little finger cover recommendation was all that I needed - Thimble Pads! While I was open to all recommendations, I was hoping for something beyond a regular thimble as they don’t often fit correctly on my finger. Someone had recommended a tailor’s thimble as I believe they are smaller/more fitted than most regular ones. I decided I’d try a Thimble Pad as size of finger was not of concern. Thimble Pads are small dot-sized pads. One side has an adhesive to stick to your finger and the other a leather or suede type material. The adhesive sticks perfectly to my finger, but also easily comes off when I’m finished and is reusable for awhile. The leather front has a good grip for pulling the needle if needed, as well as being durable enough that if you’re trying to push from the one side, you don’t feel it on your finger. Win! 1. It’s so easy and comfortable to wear that you sometimes forget you still have it on. Once I did forget and got the pad wet while getting a class of water and it just seemed to gum up and become unusable. 2. Another pad I used, that did not get wet, seemed to wear quickly and become unusable. Once they sort of gum up, they’re done. An entirely different pad I used seemed to last much longer for some reason. I’m not sure in what situations, besides the water example in #1, causes the pad to wear out more quickly. While they are inexpensive, I do want the pad to last through several sittings. Overall, I am extremely pleased with this product and LOVE having discovered it thanks to the recommendations from quilters on Instagram! I know there are several quilt and craft stores that sell them online and in-store. 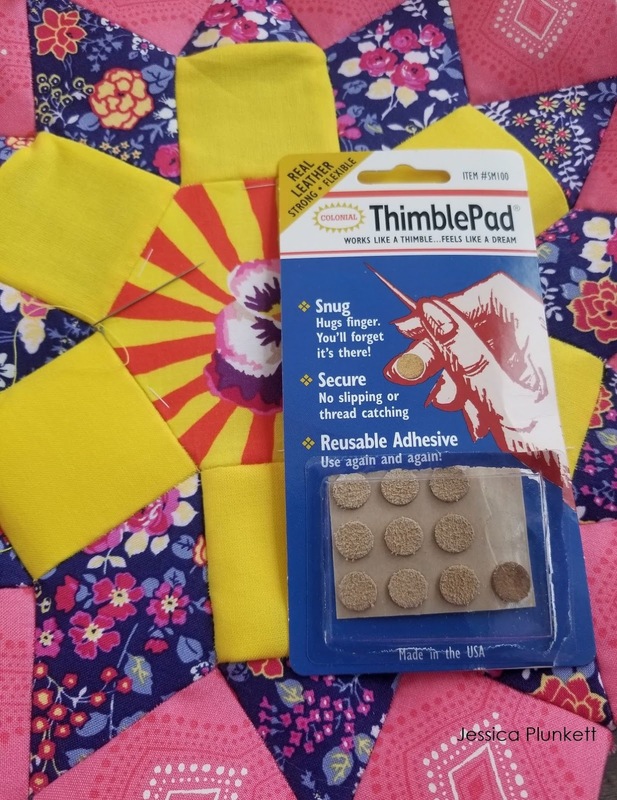 Have you tried Thimble Pads? Do you have any other finger cover recommendations?